Advice please for a potential new owner. Thread: Advice please for a potential new owner. Re: Advice please for a potential new owner. To be fair, I need a car pretty soon for work as I’m currently running around in my mums Beetle after my Insignia seized and it’s not ideal for site visits/clients. I’ve been looking at all approved Audi stock across the country and that one is certainly the best value for money..... at the moment. I’m sure if I wait long enough the prefect car will come up,but I know how useless I am. Most of the cars on Audi website don’t even have heated seats. I’ve just received a copy of the logbook to understand the previous owners and it makes no sense. How is Audi the keeper from new yet it’s had 2 owners, if was leased would that be the case? Ah, looking at this it may well I’ve been a demo, which is fine if that’s the case. Yes I would suspect that to be the case, the last keeper was probley down as, synthetic Audi, mr blogs 23 the street. But the owner would be synthetic, log book is only prof of the keeper, I'e who is responsible for tax, insurance, only a bill of sale proves the owner. 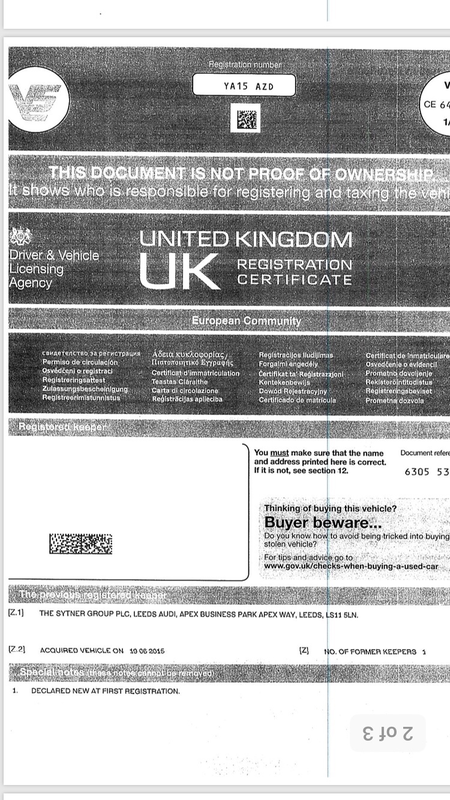 Looks genuine they would have to much to loose to start messing around, I'e there official dealer status. Little update. The 2015 car at the beginning of the post was just not sitting right with me, the service history, owner and also noticed runs on the wheel where they had been refurbished. Not great for an approved used Audi. Also, do they come with lighting pack? It has lights under door handles and LED interior bulbs, what else comes as part of this pack? Hi. Lighting sounds like ambiance lighting option has it got Tech pack, may have with folding mirrors. That’s a my17 car - built from mid 2016. They came as standard with the electric heated memory seats, folding mirrors and slightly modified inserts on the front and rear bumpers . I’m sorry I dont know about the lighting pack if that was standard too.